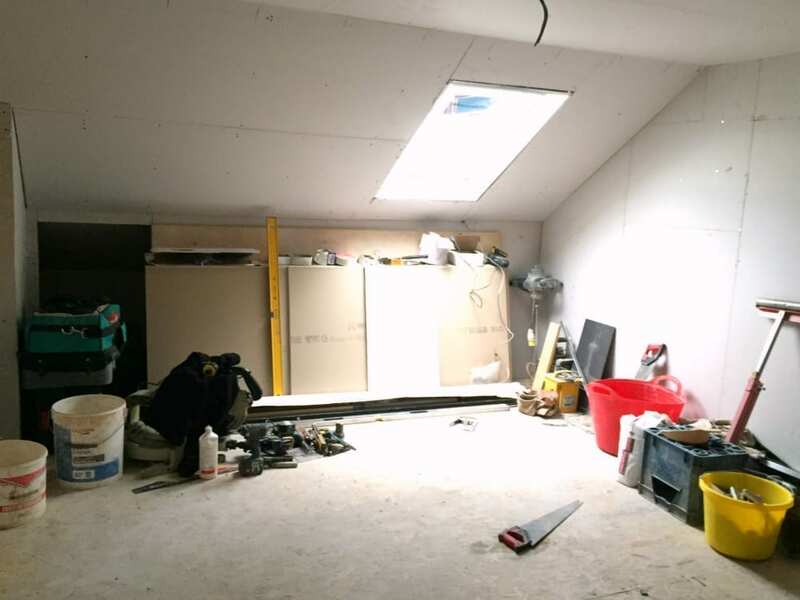 So it’s been a month since my last attic conversion update, and so much has happened. At the time of the last post work had only really just begun. It felt quite big at that stage, and it was all so exciting. But seriously, we’d only just started on the journey. I think we are now about two-thirds of the way through the project and things are really starting to take shape. The work is starting to take its toll on us as a family though, and it’s very hard living in a building site. The mess doesn’t really bother me, although everything is covered in dust, it’s more the disruption to our lives and lack of privacy. I work from home and having people in my house from 8am every morning is quite wearing. Still, it’s a small gripe and it will be worth it in the end. 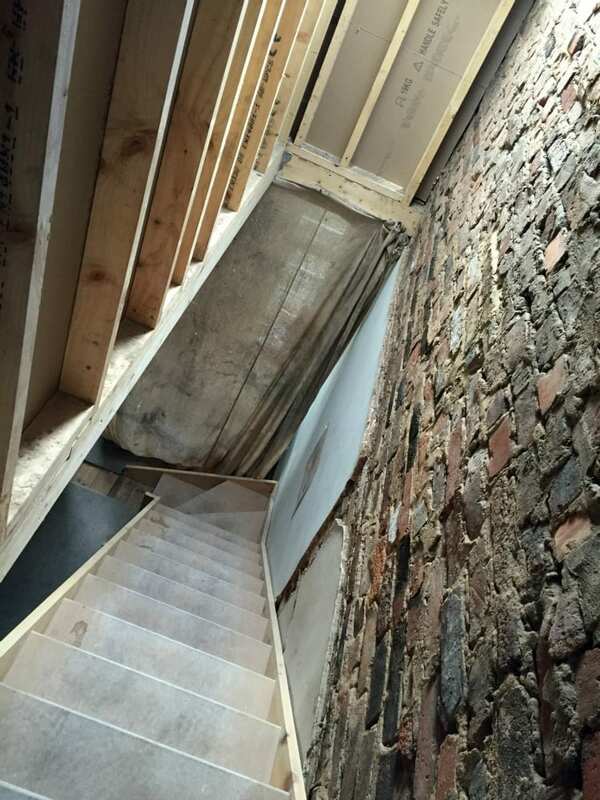 When I finished the last post walls and ceilings had been removed and the loft was being cleared. Work has really moved on so here’s a list of all the things the builders have achieved. 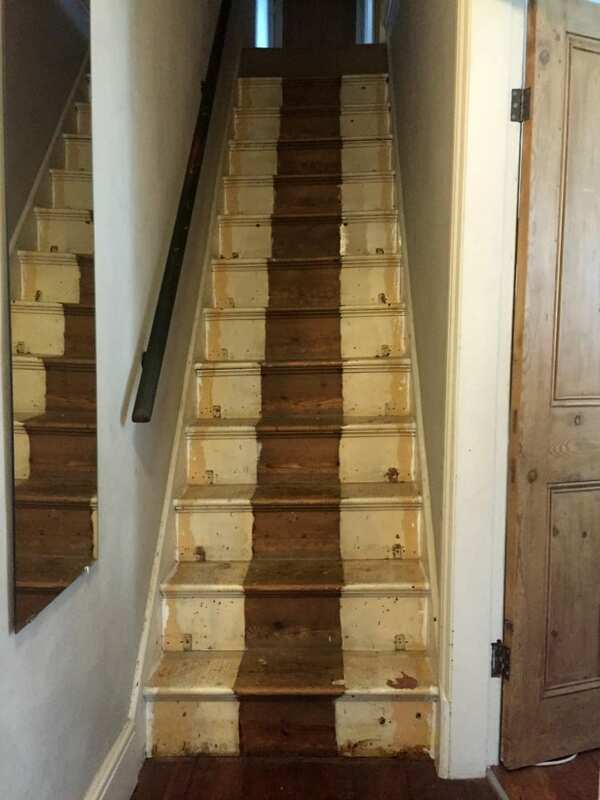 The stairs went in quite quickly although we decided pretty much straight away that they had to be moved 90mm at some stage to give us more space in our en-suite. We lost the new stud wall into our bedroom so have lived with a dirty builders sheet (above) as a divider ever since. The dormer was constructed which meant there was no roof on the back part of the house. Each night the builders covered it with sheeting but we were pretty much open to the elements for about 10 days. It RAINED. Torrential rain fell for about 6 hours one night and flooded the loft and the house. The sheeting just wasn’t sufficient to hold back the water and it poured from the loft to the bottom of the house. First floor ceilings leaked and the stairs carpet was ruined. Thankfully we are changing it but we’ve had to pull it up and put it in the skip. That’s not a night I would ever want to repeat. Watching the water pour into your home makes you so helpless and despondent. 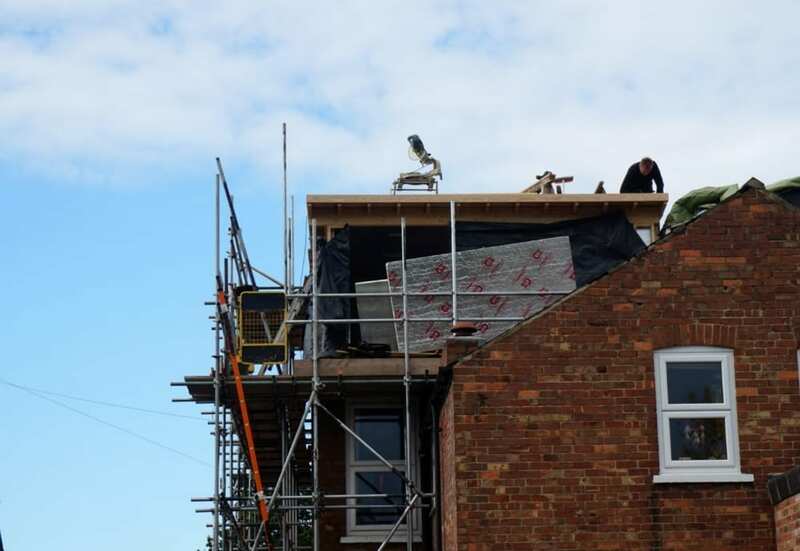 Roofers turned up eventually and started laying the roof. Several weeks later we are now water tight. Hoorah. The electrician did the first fix of wiring through the loft, landing and house. We need a new consumer unit, that’s still to be done. The plumber did his first fix. Badly. He’s been back to repair it, but it’s still not right. The building contractor has asked him to return. We’ve bought radiators, bathroom units, a shower door and tray. Sliding door frames, bathroom tiles, flooring, lighting, and more. 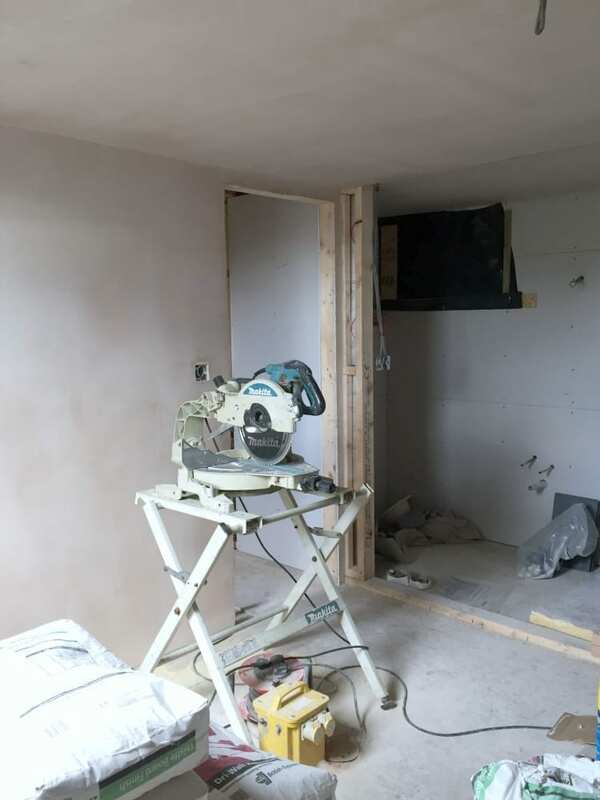 Walls have been insulated, plaster boarded and now skimmed. We can see the shape of the room finally. The Velux windows have also been installed. The stairs were moved yesterday and are in their final position now, the stud wall is back up. The windows have arrived and will be fitted tomorrow. Never underestimate the number of decisions you need to make. It’s just crazy. Yesterday I bought a sliding door latch and bolt mechanism, decided on the bolt style to hold down the dormer lead and positioned numerous lights and pendants. Our main contractor took a holiday for 3 weeks so we didn’t pay anything until half way through the project. We did pay two-thirds of the bill in one go at that point though. I’m anticipating paying the rest on completion of the work. I really want it finished now so we’re on the big push to get it ready for the decorator who will come in November. Tiling happens next week. 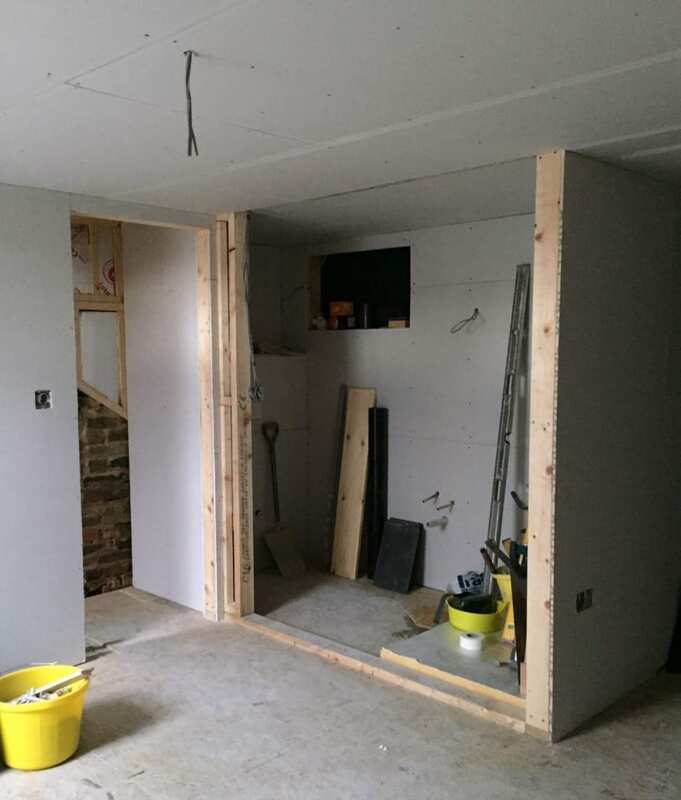 Cupboards and built-in wardrobes will be constructed and the flooring will go down. Once decorated the glass balustrade and glass wall can be installed. I’ve made a timeline for the next 4 weeks so I have a clear idea of what still need to be done and how long it might take. It has to be finished by the end of November now! More updates in a few weeks. Oh my, what a huge job! I feel for you with the lack of privacy and all the set backs, that’s terrible, but it looks an amazing space already, will be worth it in the end. I’m looking forward to the next installment! 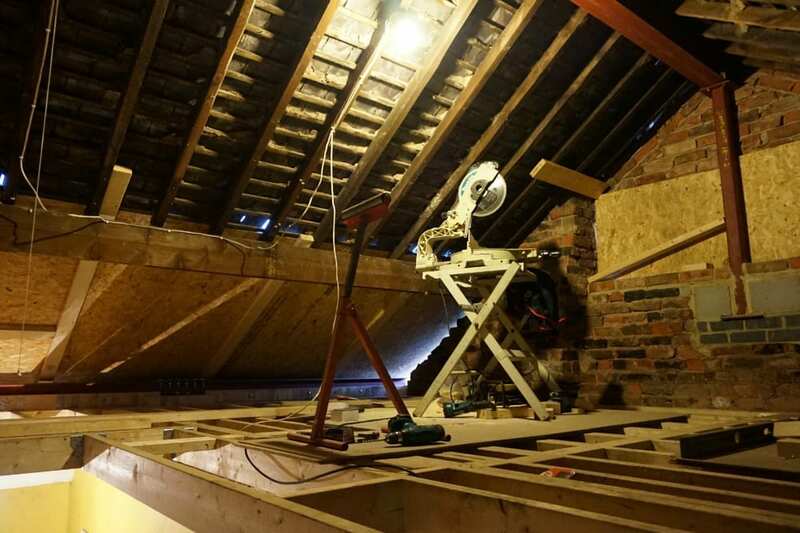 Hi Jen, I’ve only just come across your blog today, and I’m so glad I did, as we are about to undergo a similar attic conversion in our Edwardian house, just looked at your photos and am already dreading the disruption to us and our two young girls!! But it will be worth it! 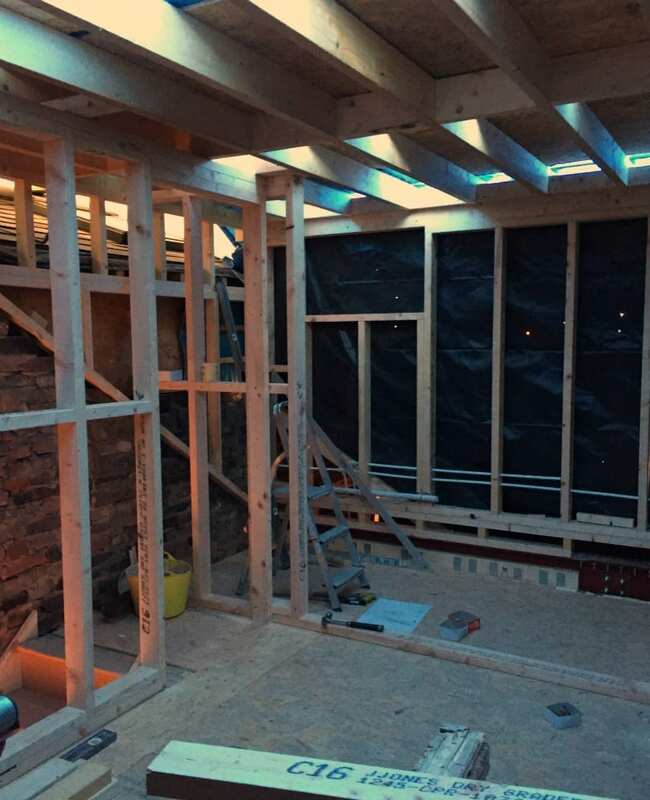 All your comments are exactly what I am thinking about in the small hours – lathe and plaster ceiling falling in our daughter, downpours in the middle of the night, squeezing storage into our ensuite, soil waste issues… I will be following your progress, so any tips welcome!! Have you sorted lighting out yet? I am thinking amazing pendant in the bedroom rather than spots but what have you decided?? That was a big job that was undertaken there! The extra space will be so worth it and best of luck with it also. 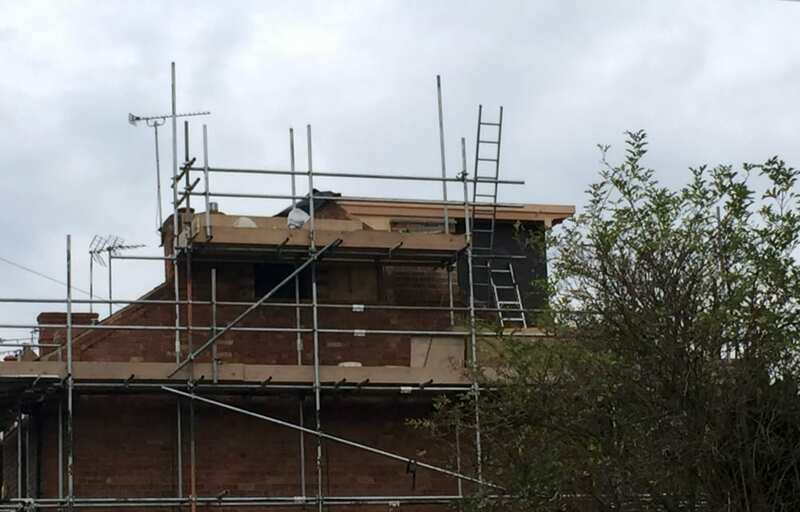 Hey Jen, yes you’re right, it can cartainly start to take it’s toll on family life after a while while you’re having a loft conversion done, I can relate to that! Your project must be finished now as you said you were aiming for November for the decorator to start? 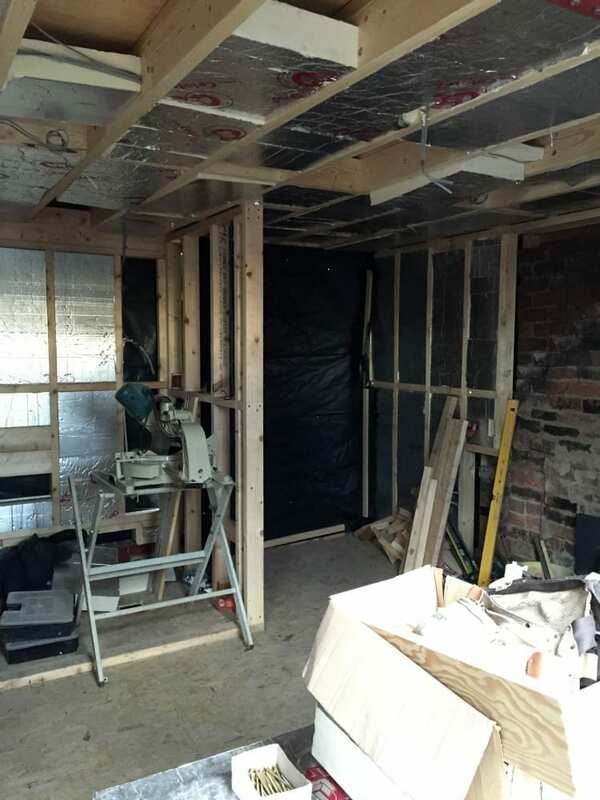 That was a big job and of course it can be difficult living in a property while the building work is undertaken. But the end result looks great.